Ok, here's the question. I just got my LTE nexus 7from T-Mobile. Everything's seems great. But I never get ANY signal in my house and not even fifty feet away from the house period. So I depend on Wi-Fi. I turned off mobile data on the tab but it seemed in my battery monitor section that my tab was still using background data to search for signal maybe? Old birthed little signal triangle was hollow but it still showed in battery history settings. I don't want this thing to sit and eat my battery AND my mobile data all day. I'll pull the sim chip out if I have to when I'm on Wi-Fi. I did the airplane mode and then turn on Wi-Fi trick seems to work ok for now. Antithetical options? I wouldn't think I'd have to turn on airplane mode then Wi-Fi to stop mobile data from searching/running/draining battery/using data plan up. Thx in advance for any help. 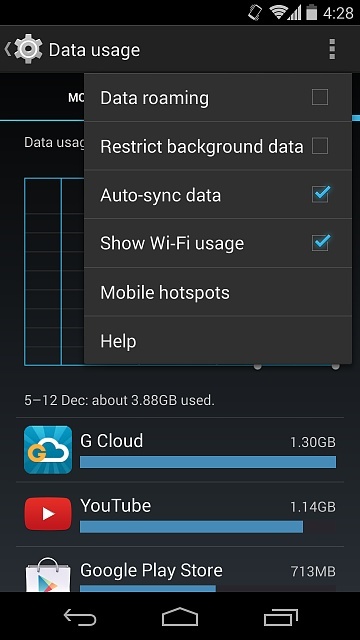 To stop your device from accessing mobile data in the background, you can enable "Restrict background data"
Go to Settings > Data usage > and tick "Restrict background data"
Should I keep the HTC one? Is there anyway to bypass the throttling?